Where you are geographically makes a difference looking at dazzling Christmas light shows. In the Southeast, many displays pay homage to the temperate region with LED bulbs and intricate scenes recreating the gardens, waterways and animals of the South. Sure, you’ll find traditions and the stories that define the holidays, but here a traveling family can also immerse in Christmas lights that tell a story of treasures particularly Southern too. Swans evoke southern moods at Bellingrath Gardens and Home Magic Christmas in Lights in Pine Mountain, Georgia. Photo courtesy Bellingrath Gardens. Christmas light displays are plentiful in the Southeast and understandably popular. Makes sense: families can bond and share laughs as they get in the holiday spirit. Bonus: There’s always a chance the weather will be easy-breezy for viewing Christmas lights. Perhaps that’s why there are so many outdoor displays and events to choose from in the U.S. Southeast. The Southeast lights offer a wide swath of traditional themes and surprising ones depicting regional culture and heritage. 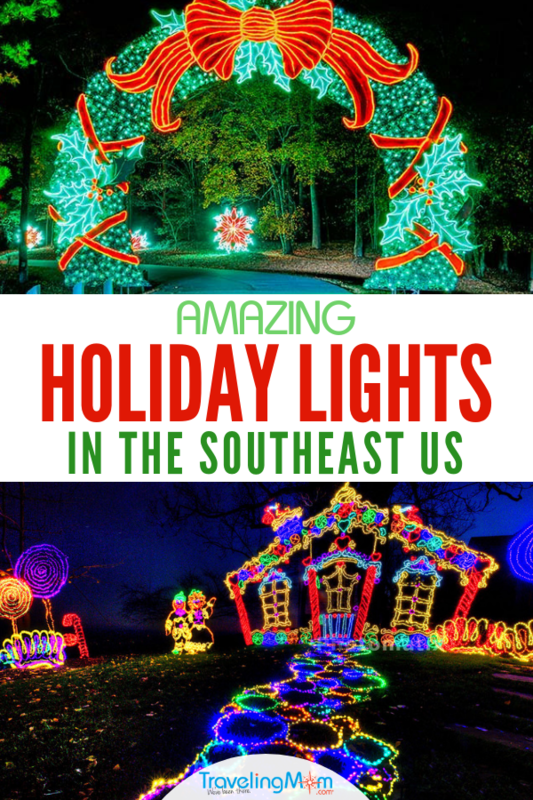 So we TravelingMoms would love to ILLUMINATE our favorite Southeast holiday lights shining in 2018. Magic Christmas in Lights, Bellingrath Gardens. Find 65 acres of azaleas, camellias, roses, fountains and terraces plus Christmas poinsettias, nightly choral performances on the terrace Sundays through Thursdays, and the estate home, decorated and open for tours.The 22nd annual event incorporates three million lights depicting 15 scenes. Choose lights and gardens only or add in tours of the estate home. 5- 9 p.m. Nov. 23 – Dec. 31, 2018. Lights only $16 adults, $8 ages 5-12. Lights plus Estate home $25 and $14. The dazzling Lightner Museum is but one of the astonishing sights throughout this historic downtown. Photo courtesy of St. Augustine, Ponte Vedra & The Beaches Convention and Visitors Bureau. 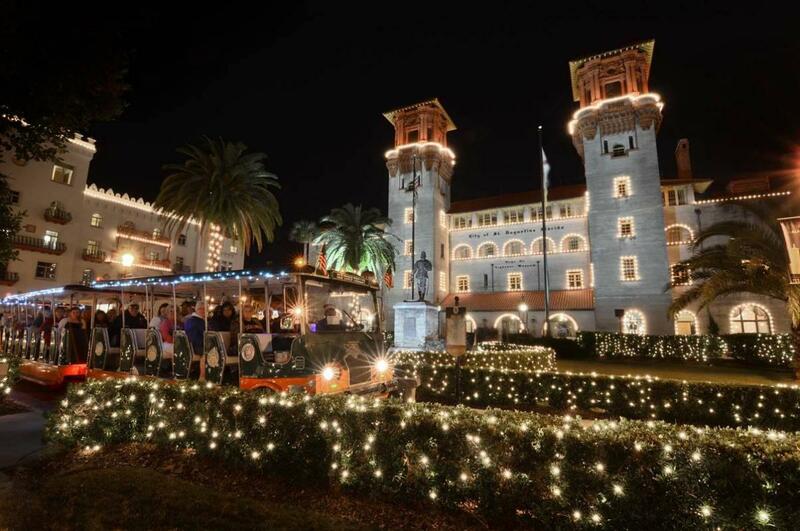 The Nights of Lights display in St. Augustine features too many-millions-to-count tiny white lights from the ground to rooftop of Spanish Colonial buildings, bay front and bridge, huge oak trees, towers of 19th-century hotels – seamless reflections of 450-year-old Spanish tradition and history. Best way to experience? On foot, bicycle and pedicab or horse and carriage, Old Town Trolley or Ripley’s Red Train. Park in the lot off Castillo Drive. 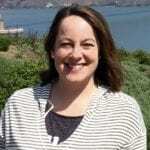 Nov. 17, 2018 – Feb. 3, 2019. Fantasy in Lights at Callaway Gardens is the place to find lights of good cheer, traditional stories, and scenes of nature within nature. Photo courtesy Callaway Gardens. Head to Fantasy in Lights at Callaway Gardens to see eight million holiday lights and sound show with 15 scenes named one of the world’s top 10 by National Geographic Traveler. The original scenes 25 years ago were designed by Disney Imagineering teams. Maybe that’s why character breakfasts featuring Rudolph, Frosty, the Gingerbread Man are a new addition. Stay for dinner and the stage show “How the Grinch Stole Christmas.” Nov. 16, 2018 – Jan. 5, 2019. Dining and lodging options available to make a trip out of it! Tickets range from $21 adults and $10.50 kids to advance prime pricing of $ 30 adults and $ 15 kids. Same day premium pricing is $ 35 adults and $ 17.50 kids. For a more intimate evening of southern scenes in the wild, head to the Okefenokee Swamp Park Light Show in Waycross. Ecological, authentic, wildlife culture in the “land of the trembling earth.” Take the Lady Suwanee train 1.5 miles through a Georgia southern pine forest in the great Okefenokee. Nov. 23 – Dec. 30, 2018. Trains run every 15 – 30 minutes from 6-9 p.m. $ 10-12 for adults and $ 8-10 for kids ages 3-11; under 3 are free. The Botanical Garden dubs its light display Garden Lights Holiday Nights. Wander through the 30-acre Midtown attraction to orchestral orbs, a glittering galaxy, the radiant rainforest and massive Tunnel of Light while sipping hot drinks. 2018 is the eighth annual, including the model trains exhibition. Nov. 17, 2018– Jan. 6, 2019 from 5-11 PM. Entry is quicker with advance tickets. Tickets range depending on dates: $ 19.95-29.95 for adults and $16.95 to 26.95 for kids 3-12. Underground holiday lights found only in Louisville, Kentucky. Photo courtesy MEGA Caverns. 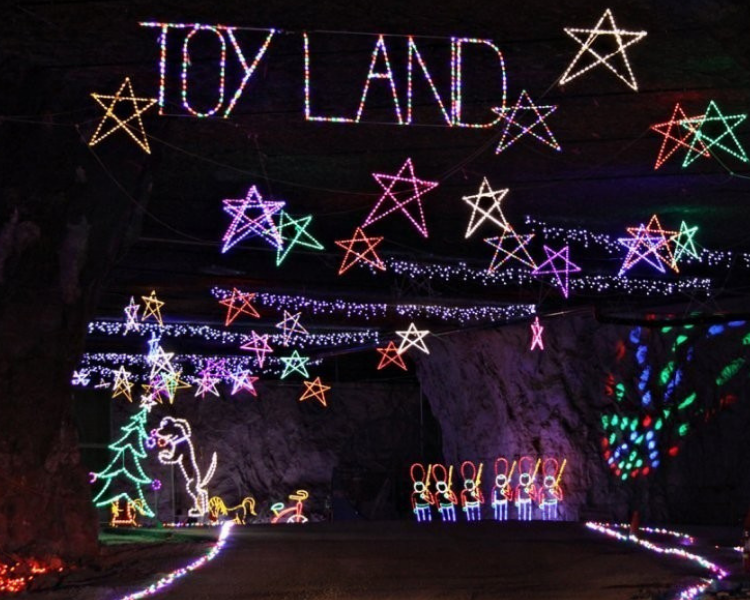 Lights Under Louisville at MEGA Caverns offers the world’s only fully underground drive-through holiday lights show. Drive your own vehicle underground for 30 minutes through 17 miles of underground passageways. Expect 850 displays with 2 millions points of light. 6-10 p.m. Monday – Friday, 5-10 p.m. Saturday and Sunday Nov. 16 – Dec. 31, 2018. $27 per car/truck/minivan. $40 for 15-passenger van. New this year: “Dinner and Lights” special event. Dinner at the Louisville Zoo, and a VIP pass to the lights show. December 2nd or December 9th starting at the Louisville Zoo’s African Outpost at 6:30pm. The Louisiana Holiday Trail of Lights winds through eight North Louisiana cities, Minden, Shreveport-Bossier, Monroe-West Monroe, Natchitoches and Alexandria/Pineville. Each city is within a few hours of another, I-20 east to west and I-49 north to south, and each has its own special way of lighting up the season. Thanksgiving to New Year’s dates may vary a bit in each unique location. Lodging along the way includes B&Bs, RV sites and comfy hotels. Start your engines for holiday fun at the Speedway Christmas in Concord, North Carolina. Photo courtesy Charlotte Motor Speedway. 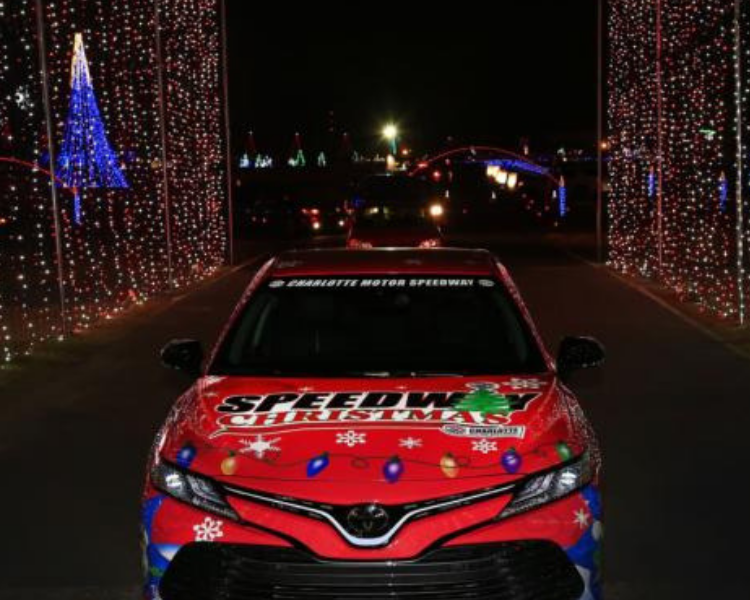 Speedway Christmas at the Charlotte Motor Speedway for the seventh year provides 3.5 million lights and holiday movies like Frozen, Polar Express, Fred Claus and Elf on a 16,000-square-foot HDTC screen. Between movies, drive through the displays of lights surrounded with music on the quad oval. Nov. 18 – Dec. 31. Movie nights Thursday – Sunday beginning at 6:30, with a second showing starting right after the first. Christmas Village features an all-new 50ft Ferris wheel in addition to family favorites like Bethlehem village, photos with Santa, fun foods, games, fire pits for s’mores roasting and more. 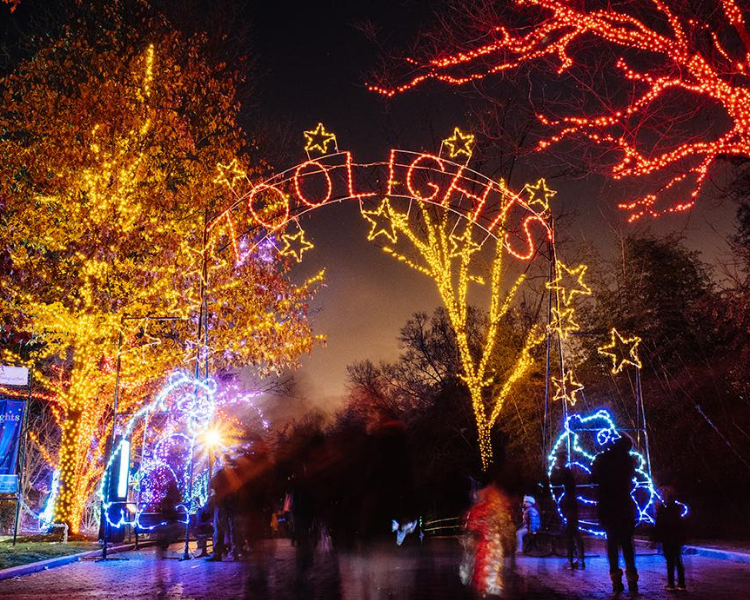 At Lights Before Christmas at the Riverbanks Zoo & Garden, most of the animals will be off-exhibit, snoozing; the creatures and characters will be 1 million lights. Nutcrackers and traditional scenes, sure, but this is a zoo so look for lighted elephants and giraffes too. 5-9 p.m. Nov. 17 – Dec. 30, 2018 (closed Nov. 22 and Dec. 24-25). $ 12 adults and $ 10 kids ages 2-12; under 2 free. 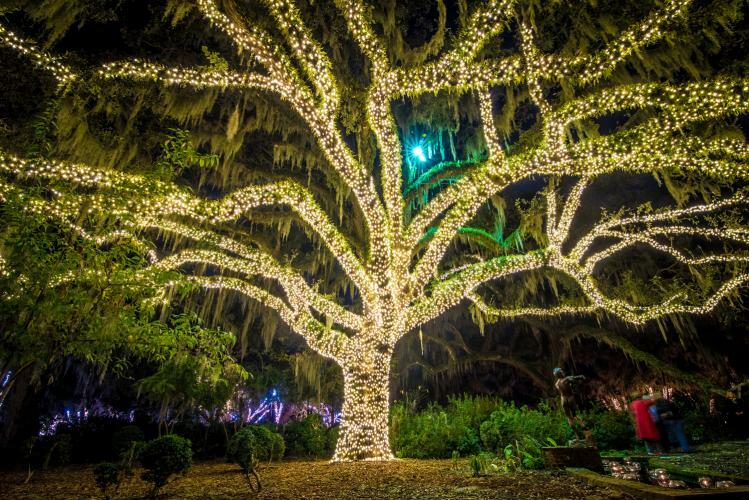 In Myrtle Beach, the Night of a Thousand Candles at Brookgreen Gardens features the incomparable Live Oak tree draped in lights. Photo courtesy Brookgreen Gardens. 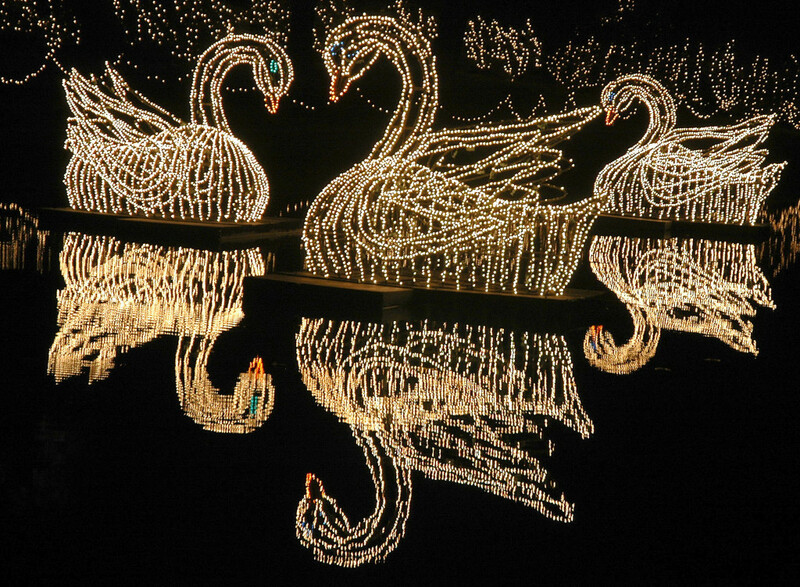 Check out Brookgreen Gardens’ Nights of a Thousand Candles Dec. 6-9, 13-16, and 20-22. What you can expect: more than 4,500 hand-lit candles and countless sparkling lights. From 3 – 10 pm, walk the paths with a warm cup of cider and listen to carolers singing holiday music. Bagpipers will be strolling through the Gardens nightly. Don’t miss the Holiday Tree Lighting at 6:15 p.m. nightly. Tickets MUST be purchased beforehand and space is limited. $25 adults; $15 kids. Rock City’s Enchanted Garden of Lights: 30 holiday scenes plus holiday characters. Photo courtesy See Rock City. Walk through a garden with 30 holiday scenes, live toy soldiers, animatronic polar bears, Inara the ice queen and trees that dance at Rock City Enchanted Garden of Lights. Four themed paths called “Realms of Wonder” are the Arctic Kingdom, Magic Forest, Yule Town and North Pole Village. Year-round this geological and botanical site presents a blend of nature and fantasy, scenic trails and vast views. Six miles from downtown Chattanooga. Nightly performances, winter characters in person along the trail. New for 2018: Bring your little one and enjoy storytime with Mrs. Claus and cookie decorating; The Magic Forest soars to new holiday heights with the addition of an all-new, first of its kind, 43-foot tree of lights; and Snowman Rock, a Rock City holiday favorite, returns. The Enchanted Garden of Lights also partners annually with the Ronald McDonald House Charities, and a portion of each ticket benefits local families whose children are hospitalized. 6-9 p.m. Nov. 16-Dec. 31, 2018. Value season pricing starts at $ 16.95 adults and $8.95 for kids 3-12 and peak pricing is $ 28.95 adults and $ 14.95 for kids. Gaylord Opryland’s A Country Christmas at Gaylord Opryland Resort is an annual tradition and ICE! is the focus again this year. Look for 2 million pounds of hand-carved, colored ice sculptures featuring the story of A Charlie Brown Christmas. Also featuring an extreme tubing hill (the only in Nashville) covered in REAL SNOW! Nov. 9, 2018– Jan. 1, 2019. Winterfest with more than 5 million lights for a self-driving tour with a free map from the Welcome Center or take the Trolley Tour of Lights. City-wide so lodging and dining options are abundant including the Christmas Inn. Nov. 6, 2018- Feb. 18, 2019. 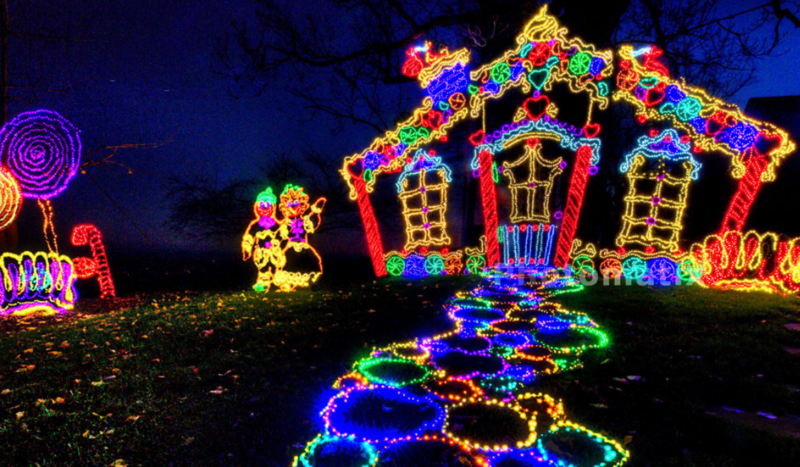 See 100 miles of lights in eight cities in Virginia. Photo courtesy of Newport News Tourism Development Office. The 100 Miles of Lights display winds from the Virginia capital city to the Atlantic Ocean Thanksgiving Day to New Year’s Day and 2017 is the 25th season. Choose from seven lighted cities with parades of boats and floats, festivals, music and dance, living history, caroling and more. Richmond, Williamsburg, Newport News, Hampton, Norfolk, Portsmouth and Virginia Beach. Specific event times available for each city. Hankering for a Tacky Lights show? Try Richmond. Lights boat parades? Visit Hampton and Yorktown. Want to walk through a million bulbs? That’s in Norfolk. The fabled lighting of the national Christmas tree on The Ellipse near The White House happens at 5 p.m. November 28th, rain or shine, for the 96th year. The tree is surrounded by 56 smaller trees featuring one-of-a-kind ornaments representing every U.S. state, territory and the District of Columbia. See the tree anytime all month and then head to the Smithsonian’s National Zoo for ZooLights at the National Zoo. ZooLights at the Smithsonian’s National Zoo in Washington, DC are fun, festive, and FREE. At ZooLights, ride the lighted solar-powered carousel with 58 animals representing the Zoo’s research and conservation records, board the trackless Zoo Choo-Choo in the Kids’ Farm exhibit , tube on a snowless track, and take in two laser lights shows set to music. New additions include a Gingerbread Village, Reindeer Games fun zone, and Symphony of Lights interactive canopy of lights. Nov. 23, 2018 – Jan. 1, 2019 (closed December 24, 25 and 31) and FREE. Attracting more than 1 million visitors a year, the Winter Festival of Lights at Oglebay Resort is a big lights display. Imagine 300 acres and a six-mile drive with 90 larger-than-life displays. For sure it’s “green” since all 1 million lights are LED. 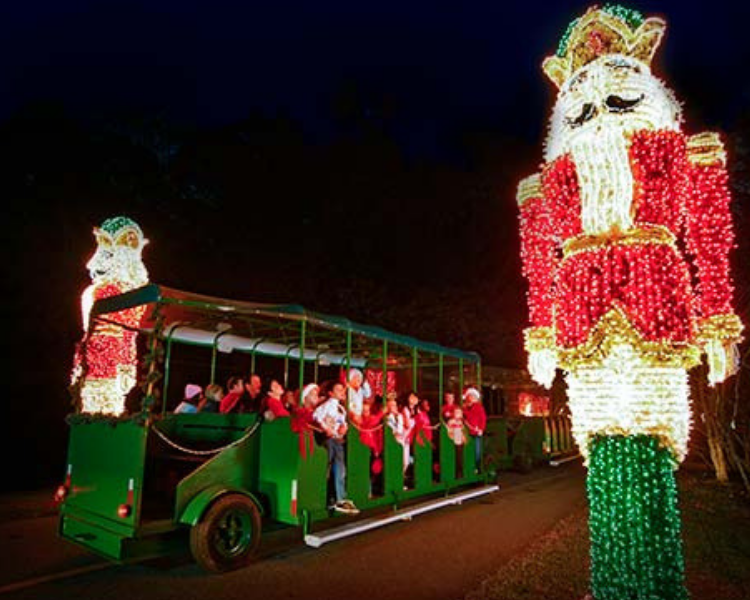 Experiences include the Glass Institute exhibition and glassblowing, dining room, trolley rides, gardens with 150 hanging baskets of lights and a choreographed Zoo Lights show on the patio. New this year: 3D Sleigh Bans! This holographic eye wear transforms every point of light into a magical display. Nov. 9, 2018 – Jan. 1, 2019. Sundays – Thursday until 10 p.m. and Friday and Saturday until 11 p.m. Lodging and dining options. Texas and the Southwest U.S. 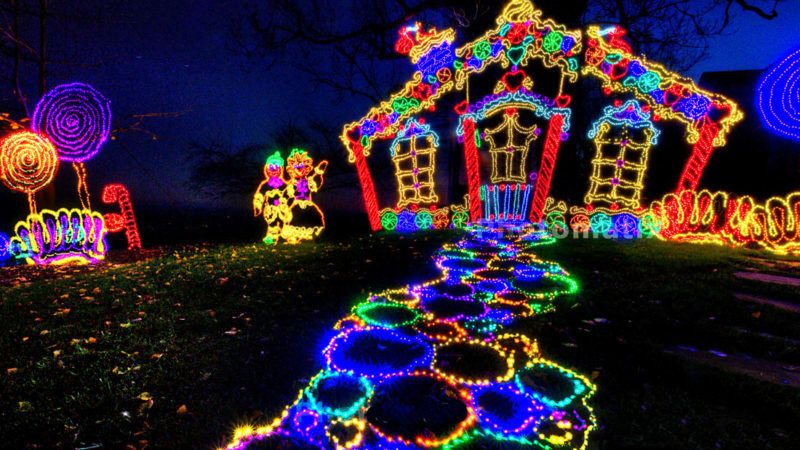 Previous Post: « Best Holiday Lights Displays in California, Hawaii and the Northwest U.S.